Denpasar: A British man has been named a suspect, along with an Australian woman, in the murder of an Indonesian policeman on the resort island of Bali, police said on Sunday. Forensic teams have identified the blood of the slain policeman in a hotel room occupied by the suspects, Sara Connor and David Taylor, police added. Connor, a mother from New South Wales, was named a suspect on Saturday. Traffic police officer Wayan Sudarsa’s body was found with wounds to the head and neck early Wednesday on Kuta beach, a popular tourist hangout in the south of the island. 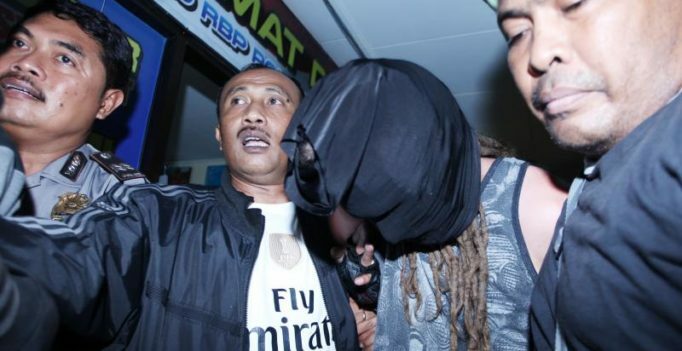 Denpasar police chief Hadi Purnomo said forensic tests had matched blood found in the pair’s hotel room with the victim, as well as samples taken from the crime scene. “There is evidence we have found that allows investigators to declare him a suspect,” said Purnomo of Taylor. Police had also gathered shards of glass from a bottle found at the crime scene they believe may have been used in Sudarsa’s murder, Purnomo added. Police formed a guard of honour on Sunday at the funeral for the murdered officer before he was cremated in a Hindu ceremony. Naming the pair as suspects is a formal step in the Indonesian legal system, which means detectives have enough evidence to consider filing charges. The murder charge they could face carries a maximum penalty of 15 years, though they could also face lesser charges. A manhunt was launched for the pair after Connor’s ATM card and driver’s license were found at the crime scene. They were arrested at the Australian consulate Friday afternoon and taken to a police station in the Balinese capital, Denpasar. Connor’s lawyer Erwin Siregar said the couple had drunk beer before going to the beach around 11pm on Tuesday, where there was “kissing”. No drugs were involved, he added. Purnomo said there were nine witnesses assisting with their investigation. Police previously said witnesses had claimed they saw a man with dreadlocks – like Taylor – arguing with a police officer. A man and woman matching their description were later spotted asking a motorcycle taxi to take them to a hotel but the driver refused as the man was covered in blood. Petty crime is common but murders are rare.